Apparently, there is a deal being worked between Stephen King, Imagine Entertainment and Weed Road to make the screen trilogy and a TV series of Stephen King’s Dark Tower Series. Scuttlebutt is that Ron Howard will be the director, Akiva Goldsman, the writer and Brian Grazer the producer. This story was apparently broken by Deadline New York. 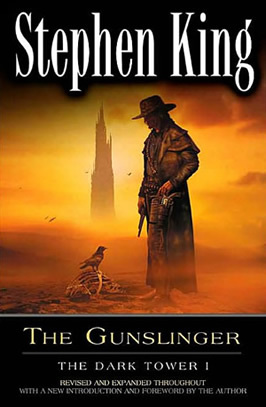 As someone who LOVES the seven books in the Dark Tower series, I’m torn about this news. On the one hand, I don’t want my imagination of what the characters look like to be tainted by an actors face on screen. On the other hand, I’m okay with Ron Howard directing…frankly, I’m not sure there’s any director that could take on this endeavor and do it the justice it deserves; and I’m interested to see what his idea of what the characters look like will be. I do hope the casting is no-names and not people we’ve seen a great deal of in other movies. Also, I’m very interested to see how one takes seven books (and multiple side stories) and make them into a trilogy. A bit of caution for Dark Tower fans…Remember Hearts in Atlantis? This movie was great on the surface, but the story is much more in depth and had aspects of it which didn’t translate in the film.